Re "If it looks random, it probably isn't"; can I presume that I can apply the same logic instead of lightning to missiles ? Meaning if a missile falls in a location is it highly probably that another will fall in the same area? Right at the top, I'm just going to say that I'm not going to say anything about the politics of this situation which has been particularly in the news, yet again, in the last few days, and I'd appreciate it if commenters didn't either. I sure do have opinions on this subject, but there are a million places people can have arguments about the Heroic Downtrodden Palestinians versus the Stoic Peace-Loving Israelis, and this blog post is not the time nor the place. Speaking of time and place, though, both things are important here, because impacts of artillery over time have a distribution both in space and in time. This is a problem which has been addressed before, most famously in analyses of where the thousands of V-1 and V-2 missiles landed in and around London in World War II. The British analysts in WWII wanted to know how good the guidance systems of the V-2, in particular, were. Since it turned out that V-2 hits conformed quite well to a random Poisson distribution, the analysts reached the correct conclusion that the V-2 did not have a guidance system capable of targeting particular areas of the city. Even the V-1s did have some kind of guidance system, though. There's a popular belief that V-1s "flew until their fuel ran out", but they actually had an autopilot that counted the revolutions of a little propeller on the nose of the missile, and put the bomb in a dive after a predetermined flight distance. That dive happened to cut off the fuel flow and stop the engine in early V-1s, creating the out-of-fuel legend; this bug was fixed in later V-1s, most of which therefore managed to do their final dive under power, as originally designed. 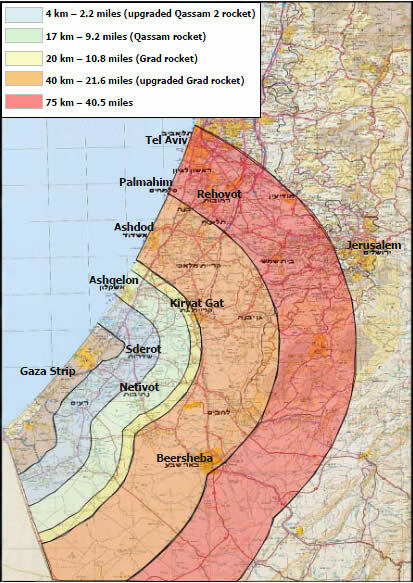 Aaaaanyway, if you abstract it all out and presume that any arbitrary square metre of Sderot is as likely to be hit by a rocket from the Gaza Strip as any other over a given hour, then the lightning-strike conditional-probability situation applies. Whichever square metre you're standing in is, by these assumptions, as likely to be hit over the next hour as any other, but in order for a missile to next hit your particular square metre two hours from now, there must by definition not be a hit in the next hour. So, as in the lightning-strike example, you multiply the probability of no-hit next hour by the probability of a hit the hour after that, and get a slightly lower number. The probability of a hit in any given spot in any given hour is the same, but the probability of the next hit being separated from now by one, or ten, or a million, hours gets lower and lower as time wears on. This is of no use whatsoever in determining what location's going to be hit next, though; we assumed right at the start of our abstraction that the missiles were falling randomly. It just explains why clusters of hits, close in time and/or space, can and will occur - and encourage the statistically untutored to explain them in terms of aim and guidance systems - even if the actual distribution of events is random. ...making the overall situation extremely complex. But the more sophisticated actual military rockets definitely can be aimed, at least to some extent, so the distribution of their hits will be skewed toward populated areas, military targets, or whatever else the people launching them are trying to hit. You could probably protect yourself from those rockets by a considerable amount by going and living in a tent in the middle of the desert. As regards avoiding getting blown up in the Israeli towns within rocket range of the Gaza Strip, though, I'm afraid conditional probability has nothing to offer you. All it tells you is that it's improbable that some particular location will not be hit for an extended period of time, which you already, unfortunately, knew. Would be interesting to study how it ends up. I think if the missiles can be aimed decently, then it would seem likely their operators would try to send them in a cluster with wide spread (considering the goal is maximum civilian damage, apparently). In that case I'd say if you have one of these land on your building, don't run out into the street. 1. Keep in mind that the people firing the rockets keep track of where the rocket hit, and if it is a favorable location keep the launcher aimed there. During the last Lebanon war, for example, IDF soldiers captured launchers with stickers on them designating their specific target ("Nahariya hospital" was one iirc). In that same war the area within around 500 of my friend's house was hit almost daily for weeks. 2. The Hamas is currently deploying the same Iranian made military grade Fajr rockets the Hezbollah used in addition to the home made ones. Supposedly they are more accurate and have better range. 3. According to the safety instructions we're getting, those rockets can blow throw one building wall at most, so if you make it into an internal room you should be mostly safe. 4. This, combined with the Iron Dome's phenomenal success rate has emboldened some people enough that when there's a siren they whip their mobiles out and try to capture an interception instead of running for cover. 3 people already died because they were watching the light show out the window. 5. You should get a beta key and try Hawken. Far more entertaining and ridiculously more pretty than MWO. 4) I can imagine the scene. "Look at all the fireworks! Hey, what's that rapidly enlarging black dot? Oh, crap..."
Seriously, if people really want to capture the action they could just set their phone and/or camera on a stand and then get the hell away. Addressing the important part of this, which is of course the imaginary Internet robots, I'm in Australia and there are no local servers, which completely rules out a twitch game like Hawken; it's not as twitchy as the completely demented Quake-like FPSes, but a 250 ping will still be agonising. Well, I'm in Israel and while I haven't bothered to actually check my ping I do get a decent enough speed that I can hold my own in the game. And that's with the almost-cheapest internet connection available here (10 Mbit/s I think). The same can not be said for other online games, where I occasionally get latency so bad I become stuck in walls and such, so maybe Hawken's net code is more efficient. I love Gravity's Rainbow. Read it three times. You've convinced me to go for read number four. 4) As you can see in the far too many videos posted in YouTube (like this one, taken during a freaking wedding: http://www.youtube.com/watch?v=8kAyqbKwd1o&feature=BFa&list=HL1353438967), its mostly white dots. Anyway, you get about 15 seconds between the siren and when the rocket is supposed to hit, which probably isn't enough time to get a mounted camera pointed in the right direction. Plus I guess it would have to track the rocket in the sky. 5) Hawken is more shooty, but having tried both betas I feel it does a much better job of relaying the sense you're stomping around in a giant death machine. Mostly due to the insanely detailed environments, effects and animations. The robots thump and skid around realistically, small debris explode as you hit them, sparks shoot up when you rub against walls and plumes of dust shoot up when you hit the ground running (in MWO I walked through a forest- literally- no tree fell). Gameplay wise, its like mech-lite. Only two main weapons and a few deployables, and (so far) fewer mechs and parts to choose from. But weapons overheat, there are distinct roles to choose from, and team battles do have a strategic element to them. Most importantly, the game is much less P2W than MWO. As it is primarily skill based, your lethality is only determined by your piloting skills. Money only buys you nicer looking parts and paint jobs. Ack, replied to the wrong post. Pretend this is under Fallingwater's post. Thus far in MWO there is precisely one tree you can knock over. I think they were all knock-overable in closed beta, but that was removed along with collisions between 'Mechs when open beta made physics problems more obvious. It's on the to-do list. 1. Who drew that range map? I'm trying to work out the relation between the 4 and 17km range rings. Presumably the shortest range rockets are the most numerous - they would be cheapest to make / least reliable. So if their range is only 4km, why is the blue ring at more like 8km? OR is the blue ring 4km from the nearest border and the 17km ring is from the furthest border? Option A is just sloppy, option B is sinister, as if shifts a perceived risk zone closer to Gaza, while slightly reducing the perceived risk from presumably larger rockets further out... maybe thats where the TV cameras are. *sigh* truth is always the first casualty so we'll never know. 2. Anti-missile-missiles. I can see the point in defending a point location (say an aircraft carrier) sitting in a large area of little habitation, but defending an entire settled region seems a bit daft. Won't you end up causing more damage by 'friendly' spent munitions? - the first video presumably showed one enemy rocket inbound, intercepted by at least 10 defense projectiles. Presumably the flashes shown were self-destruct charges, but surely there would be a lot of shrapnel raining down on you. No way would I stand on a roof top filming it - it doesn't matter who fired a 350g chunk of metal traveling at close to Mach 1 if the thing hits you. If there's one thing projected energy weapons seem made for it's anti-missile work. As long as what you are defending is a power station, of course. I believe you're wrong about the missiles. I think when you see the Iron Dome batteries launching a lot of interceptors, each has its own target. Keep in mind that artillery rockets are usually fired by Grad- or Katyusha-style launchers. I think they're launched in fusillades even when basic rail launchers are used, simply because the Iron Dome would make short work of any single launch. They need the numbers so that at least one rocket will make it through and blow up against something valuable. The Wikipedia article on Iron Dome says about two inteceptors are fired at each rocket. "On 30 December 2011, The Jerusalem Post reported that a performance analysis it had obtained shows that Iron Dome was successful in downing rockets from Gaza 75% of the times it fired. It said two interceptors are usually fired at each rocket." (The success rate is closer to 90% now). One of the strengths of this system is that unlike previous system like the Patriot that just knocked their target out of the sky, it completely destroy the target warhead before it makes it over its destination. I remember burning Scud chunks falling everywhere during the Gulf war. But so far there has been one reported case of wreckage for an interception making it down and hurting someone, for hundreds of interceptions in the last few days. Image the launchers are arranged in a long row along the Gaza strip border. The blue area is the maximum range they would cover. Yeah, I did the same thing with Goedel, Escher, Bach. Hofstadter loves the sound of his own voice soooo much. Sat in a seminar with him, and he's even more pretentious (and illogical) in person. Grr. Arggh. Frankly, I liked Gravity's Rainbow slightly better. On the original "looks probable" question, for there to be a lightning strike, it helps if there is a thunderstorm happening. A big question in weather prediction is if you can beat a trivial prediction of whatever happened the day before. It stands to reason, that for n days after a thunderstorm, the first day would be the most likely for another storm and drop off from there. I would not be at all surprised if this statistical increase was higher than the simple required distribution due to repeated sampling of the odds.